From the Anvil snib and release locks, also known as thumb turn locks, are perfect for bathrooms, toilets and bedrooms when only a privacy locking mechanism is needed. These locks can also be added to exterior doors, as a secondary locking method. In case your front door doesn’t have a door handle, we would recommend our cylinder pulls and centre door knobs. Privacy and security on exterior doors can also be enhanced by installing a door chain and peephole. Entrance doors can represent your personality and style by choosing the right door furniture. 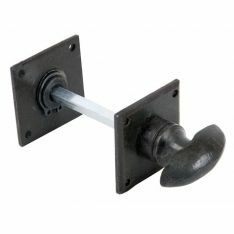 At Ironmongery Experts we supply a wide range of door furniture ideal for front doors, from unique and handmade door knockers, keyhole covers and door numerals, to antique-looking letter plates and letter tidies. Additionally, we have available a selection of kicking plates and finger plates by From the Anvil. These plates are perfect for commercial use, protecting the bottom of doors from scratches, dents and any other type of damage. We also supply a variety of door stops which prevent scuff marks and holes on walls from opening doors too widely or quickly.